This is by far one of our favorite smiles to have ever crossed our face when it comes to audio. It's like nothing I've ever heard before. 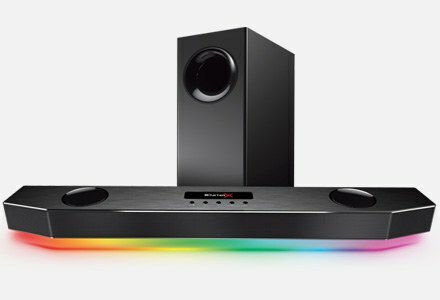 Without Super X-Fi, music sounds flat. With the dongle, it actually sounds like you're at the studio or a concert. This is the best thing I saw or heard all week at CES. Super X-Fi headphone amp pretty much made headphones come to life. SXFI AMP delivers superior audio clarity and sound performance, and is crafted with a single aluminum unibody with a fine-textured, anodized black finish. It weighs just 15 g (0.5 oz), making it ultra-portable. Experience music on your headphones as if you're listening to the recording artist in a studio! Enjoy Super X-Fi on your local hi-res FLAC files or stream your favorite songs over Spotify app on mobile or PC with SXFI AMP. Try out some old mono tracks from the golden age and you'll be amazed how Super X-Fi transforms the music. Immerse yourself in a holographic audio experience whenever you are with your headphones. Whether you are watching movies on your laptop or travelling on an airplane with your Android phone, just plug in the SXFI AMP and enjoy! 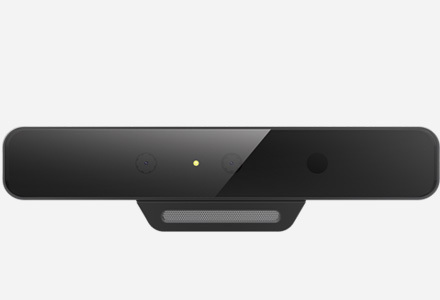 Super X-Fi is capable of transforming videos into full-fledged, cinematic audio experience. Enjoy games with the full cinematic capabilities of Super X-Fi! Simply plug in the SXFI AMP with your headphones into your PS4, Nintendo Switch, or on PC — the soundstage of the game opens up and you feel as if you were actually transported into the game environment itself. Your games will never sound the same anymore! Simply connect the SXFI AMP to your Android phone to experience the magic of holographic audio. Featuring a USB Type-C input port with a 3.5 mm audio jack output, the low-jitter asynchronous USB enables precise data transmission and digital timing integrity. A 4-inch C-to-C cable is also included in the package. For devices without a USB Type-C port such as older PCs/Macs, a USB A-to-C cable is required. Set up your personalized listening profile using your Android phone. Simply plug in the SXFI AMP and your preferred headphones with your phone, select your headphone type and you're all set up! TIP: When switching headphones, make sure to reconnect the new headphones and your Android phone to SXFI AMP to select the new headphone profile for the best Super X-Fi experience. Users can switch between profiles simply by logging in their Super X-Fi account via their PC. No hassle of having to reconnect the SXFI AMP with your Android phone! After setting up your listening profile, just unplug your phone and connect the SXFI AMP to your console with the same headphones. Now, enjoy full cinematic capabilities of your game with Super X-Fi! 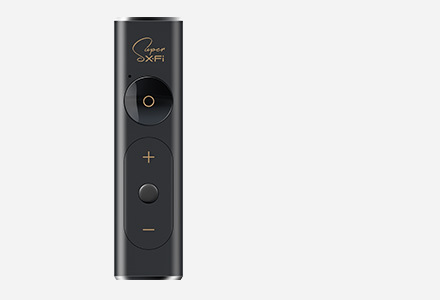 The SXFI AMP allows you to control music playback and toggle between having Super X-Fi technology on or off. It's convenience at your fingertips! SXFI AMP is a premium high-performance headphone amplifier that is capable of driving even studio-grade headphones — easily beating some of the most expensive headphone amps on the market today. 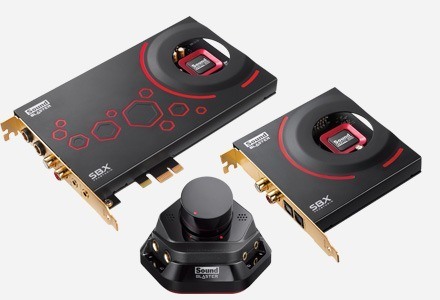 SXFI AMP delivers 3X amplification gain for exceptionally powerful audio performance. It supports headphones with high impedances of up to 600 ohms, powering even studio grade headphones with your mobile devices. Using the AMP, you can now enjoy the full specs of your top-grade headphones wherever you are. SXFI AMP uses a separate 128dB high-end high-precision AKM 32-bit DAC. This provides maximum audio fidelity and pristine quality yielding up to 120dB SNR, and 0.0003% THD. The AKM DAC is known in its field to offer outstanding fidelity, especially for original sound reproductions. 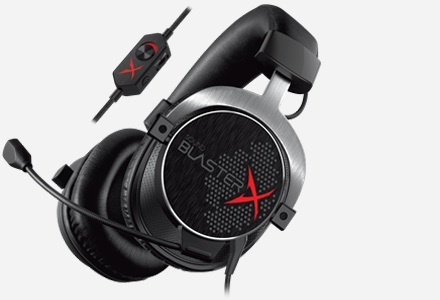 This supports and ensures high-resolution audio playback so you can hear every detail in your audio. The Aurvana SE is a special edition of Creative's Aurvana Live! 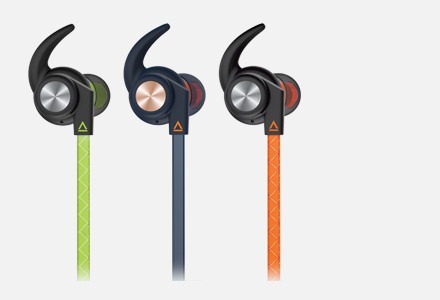 over-the-ear headphones with high-definition audio. It is Super X-Fi certified and custom-tuned to complement the Creative SXFI AMP for an optimized Super X-Fi listening experience. Lightweight and ergonomically designed, the Aurvana SE is perfect for listening to music on the move or for your home entertainment use. Constructed with revolutionary driver technology and in-depth acoustic tuning, it delivers a natural and faithful audio presentation akin to a live performance. Sharp transients and dynamic passages are handled with effortless finesse. 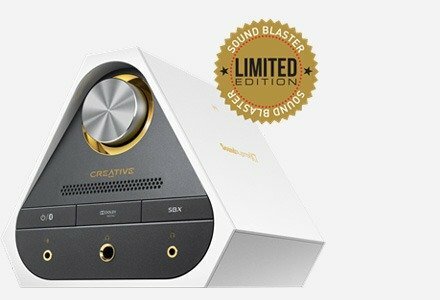 GET YOUR FREE AURVANA SE WITH PURCHASE OF CREATIVE SXFI AMP! The Aurvana Trio features a hybrid triple-driver system to deliver exceptionally pristine audio across the audio spectrum. It is now Super X-Fi certified to complement the Creative SXFI AMP for the best listening experience. Offering astounding clarity down to the most minute detail, the Aurvana Trio is engineered to deliver rich yet balanced sound reproduction that is life-like and true to its nature. It is fitted with a detachable MMCX braided cable, so you can choose to swop it out with your own specialized aftermarket cable. With a top-up of just $30, you can enjoy exceptional audio listening with the audiophile-grade Creative SXFI AMP + Aurvana Trio Bundle. Available exclusively at Creative.com. SXFI AIR heralds a whole new generation of advanced headphones that incorporate Super X-Fi technology right into the heart of a wireless headphone. SXFI AIR comes with an accompanying SXFI AIR Control app so you can personalize your audio.